George Brett was born in Ohio and graduated from Virginia Military Institute in 1909, joining the Philippine Scouts before accepting a regular commission in 1911 in the cavalry. Completing flight training in 1916, he went to France in late 1917 and was in charge of purchasing and distribution of all aviation materiel. As a result, he never saw combat. Brett rose rapidly through the ranks in the years just before the war, acting for Arnold as chief of the Army Air Corps when Arnold was temporarily transferred to the Army General Staff. When Arnold became chief of the newly-created Army Air Forces, Brett retained the old title, spending his time in this post touring airfields in Britain and Russia and fighting for greater autonomy for the Army air forces. Following the outbreak of war in the Pacific, Brett visited China to explore the use of heavy bombers in this theater, then took command of U.S. forces in Australia. Brett worked to cultivate a close relationship with John Curtin, but was approached by the Country Party with the offer of their political support for obtaining the top Southwest Pacific command if the Country Party regained power in the next election. 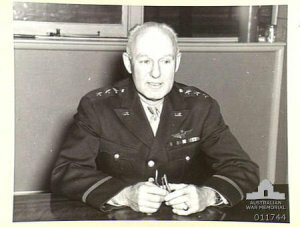 Thereafter Brett added a number of Australian officers to his staff and attempted to integrate Australian personnel into American aircraft crews. This did not work out well, as cultural difference were exacerbated under the stress of combat. In the end, the Southwest Pacific command went to MacArthur. Brett recommended that no further resources be expended in what he saw as a losing cause on Bataan. When ordered to fly MacArthur out of Mindanao, Brett tried unsuccessfully to persuade Leary to make available the relatively fresh B-17s under Navy control, and Brett's attempt to make the rescue using battle weary Army bombers was a debacle. Leary was then ordered by Washington to turn his aircraft over to Brett, and the second attempt to fly MacArthur out was successful. However, the episode permanently soured Brett's relationship with MacArthur. One of MacArthur's staff described Brett as "a rather easy-going Air Force officer who was probably a better flyer than administrator" (Gamble 2010). Brett had the support of his old friend, Marshall, but Secretary of War Stimson had little confidence in Brett, and Marshall finally saw to it that Brett was replaced by Kenney in August 1942. Brett spent the remainder of the war commanding patrol units in the Caribbean.